Ok I will attempt to write a post with my injured laptop because I am uber excited about this! 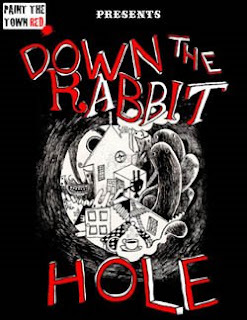 Tomorrow I'll be attending an Alice in Wonderland themed performance called "Down The Rabbit Hole" by a company called "Lets Paint The Town Red". This is no ordinary performance though - you get to explore the massive Victorian warehouse that hasn't been used for a performance since 2003 and listen to new bands play at the "Mad Hatters Tea Party" with a dining table hanging from the ceiling (don't think the actual bands will be doing the same though). This reminds of a Faust performance I went to see a few years ago in a warehouse in East London by a company called PunchDrunk. The audience had to wear masks (sweaty fringe alert!) and follow the actors around different rooms and stages in the play and at the end there was a sort of barn dance party to celebrate, get pissed and get a-talking to the actors. Anyways weird theatrics aside, I am really tempted to dress up as Alice tomorrow and put my own little twist on it. This thought led me to remember the amazing photo shoot in Vogue in 2003 shot by Annie Leibovitz (and also reminded me about the "Toxic Teaparty" photo shoot I've been meaning to do for about a year now), where "Alice" (Natalia Vodianova) is featured with a different designer wearing their creations. You can see all the photos here but these are my top 3 favourites. Dear Stylistique, I love your blog. Keep up the fantastic blogging. I have a question do you know any menswear websites or blogs? Are any of the links in your blog of any menswear websites or websties with both menswear and womenswear? Please let me know. and scroll down there's a menswear links section - hope that helps. I also love this guy's blog - it's a mix of everything but you do get a good menswear post once in a while. I've got to say I love your blog! I like the way you're not just able to mix happenings in fashion alongside interesting little life tidbits (e.g. The Convenience Store)... but do it smartly too. i saw you on the altamira nyc: great style! thanks for all the compliments guys - mucho appreciated. it's nice to know that people actually read this blog and that i'm not just rumbling on to myself!